It’s that time again, for me to post about recent inspiration. 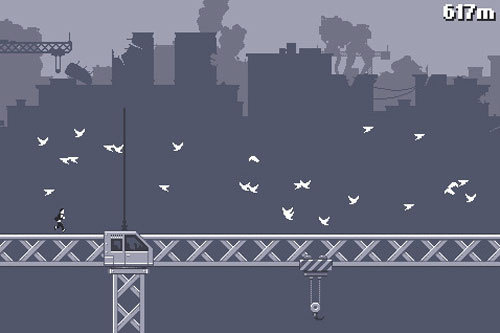 In the last post you hear about my new game idea and the artwork. I shall exaplain the inspiration behind the idea and show you some more wonderful artwork. So just how did I come up with the game idea? 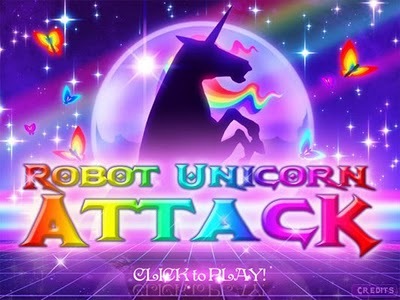 A mixture of ideas from Forbidden Planet and simple yet addicting flash games like robot unicorn attack and canabalt. 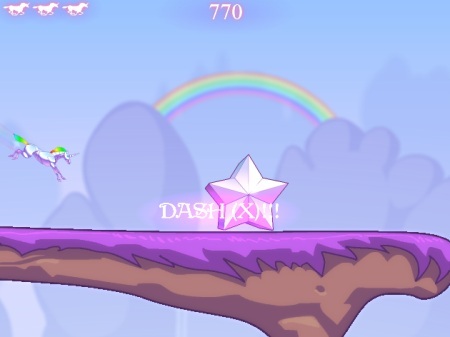 The flash games robot unicorn attack and canabalt are, on the surface, very similar games. They use little controls in order to play them, two keys for RUA and one for canabalt. The basic premise is that you control a character who is running and slowly getting faster and faster, every so often the platform they are running on runs out and they need to jump onto the next one. You just keep on going doing this until you miss a jump and hit something. In RUA, you get to smash through stars to earn you extra points. These two games are incredibly addictive and have become hugely popular for it. RUA has some nice visual flair as well, its a wonderfully camp, colourful and fun game. It features some music by erasure too to give it some extra campy fun points. 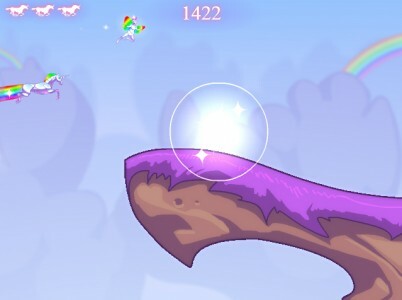 You play a unicorn who runs around leaving trails of rainbows as you jump from platform to platform, its stupidly fun for what it is. I think that this game has some qualities that I want to include in my game. I want it to be just as fun and addictive to play. This is also why I have gone with the choice of artwork that I have. Fun graphics is going to be enticing to play. Simple controls makes it fun to play. Mind control makes it amazing. RUA is made by adult swim. I like the fact that it doesnt take itself seriously and lives in a fantasy land where all of this can happen. And why not? Why make games that reflect our reality, when we can make games that are just utterly fantastic and full of imagination. 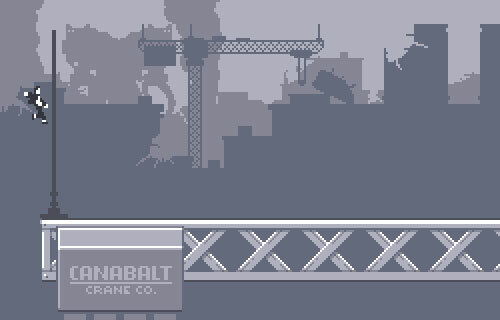 The other game, canabalt, is, in terms of looks, drastically different to RUA. It only exists in shades of grey and has gritty, robotic music. Not so pleasing. Yet, the gameplay is just as simple and fun. But, just like RUA, they have a similar way to play and show character movement. They both move the character forwards for you in a side scroller type fashion. I like this. They both keep the character center and you control the jumping of the character, I also like this. The reason I like this is because I have a limited set of interactions through the mind reading headset. I can read two brain values and also track head movement. Making a game so that its all simple to control with as little controls as possible is great. My plan is to control the amount of enemies on screen with the relaxation values and then get rid of them through head tracking and maybe more thought power. Lovely. Simple, fun gameplay. And now for some more artwork. Another cover for the Super Furry Animals. 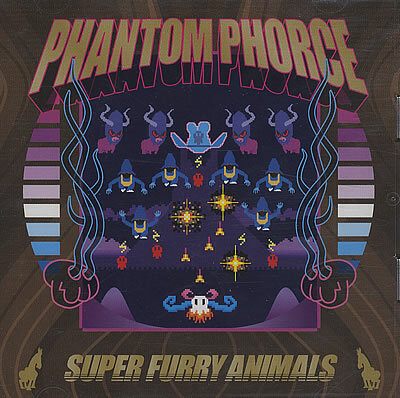 This time the album is Phantom Phorce. This cover is styled like an arcade game which is nice. 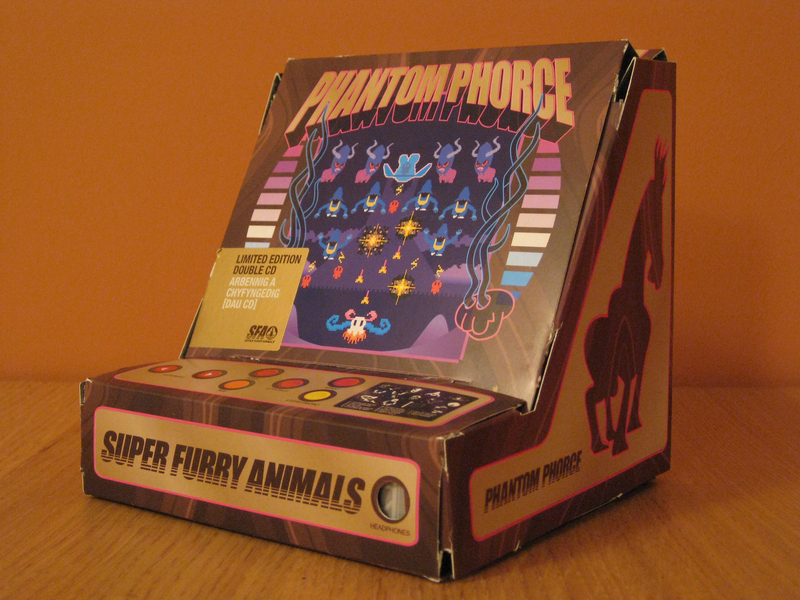 But the really nice part is that the case folds into an arcade cabinet too. Isn’t that just brilliant? Maybe I could incorprate something like that into my work. Some nice physical thing to play with or possibly take home as a momento. Interesting thoughts.